I did my run over to the park and back this morning and I didn’t meet any weird people:). Maybe I can go back to that run as I much prefer an out and back or a single loop over running the same loop multiple times! I got to run a full thirty minutes and every kilometre was under 7min!😀🎉🎊. I started wondering how many times I needed to do that before I could check that goal off when a friend told me, “when it’s every time”. Lol I guess that answers my question. Amazingly I didn’t even feel as though I was running that fast! Today was a pretty good day:) we got through a book review activity this morning that just happened to be on a book about being peaceful towards each other😂. We also finally got started on problem solving. I planned to work this into my math A/B week plan from the start of the year, but it just didn’t happen. We started with the strategy of drawing a picture to solve the problem. It is going to take a lot more practice, but we at least got started!! For breakfast I tried a new type of cheese on my toast. I liked the simple packaging of the cheese and it smelled wonderful when I opened lithe package- spicy! It even tasted good, but boy is it dense and rubbery! I also don’t think it melts as it didn’t even soften up on my warm toast:( if you’re hiding the cheese in something, like a sandwich with lots of veggies, I think the taste would make it a winner, but if consistency is going to be noticeable, I’d give this cheese a pass. I also tried a new bagel at lunch. We had the leftovers from yesterday today. The bagels were Udi brand. They felt dense like a bagel should, were not overly dry, split in half nicely and were a good size. I would definitely recommend this product if you’re looking for a bagel. I have also done some baking this evening. My co-teacher has been fabulous lately and so I wanted to make her cookies. She is diabetic so I know not to use sugar and I have been trying out different types of “banana cookies”. I call them this as they utilize bananas for sweetness. 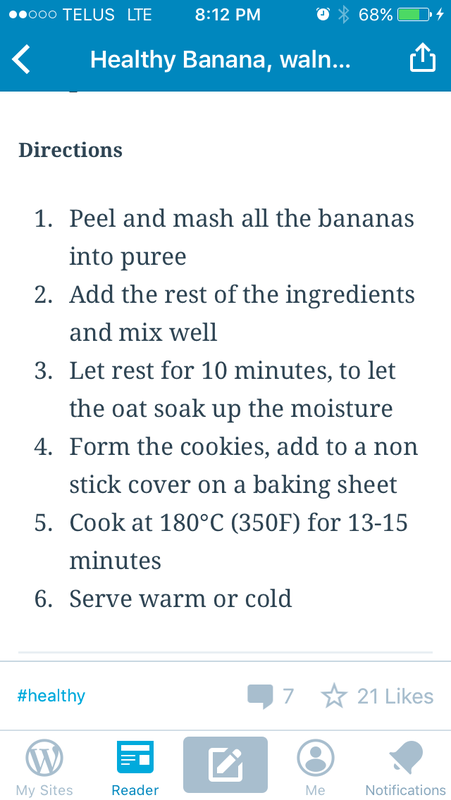 I tried this Recipe by Foodolic for banana maple walnut cookies. I followed the recipe, but mine don’t look like hers:( We’ll see what they taste like tomorrow! I also got my yarn wound into a ball in preparation for making a toque to go with my new jacket. I just want a nice simple toque so that the gorgeous colour variation in the yarn will be highlighted. If anyone has a pattern suggestion, please let me know! I want to start it tomorrow at knit night! I have the best mom in the world as she didn’t say a word about how messy it was when she was here sewing today. I know she says she doesn’t care, but I want the place to be nice so everyone will like it as much as I do! My mom also grabbed the BB cream I had been looking at on the weekend and a sweater hanger for my closet. I really wanted to move my running gear into it, but I made myself tidy instead so it will have to wait:( I can’t wait as I think it might be a system that will work really well for me! Sometimes the house/apartment is a mess but that’s life! I’d rather have a messy apartment for a few days but enjoy life and different outings then stress about always having it 100% clean. Just my philosophy though! I blame mine too. 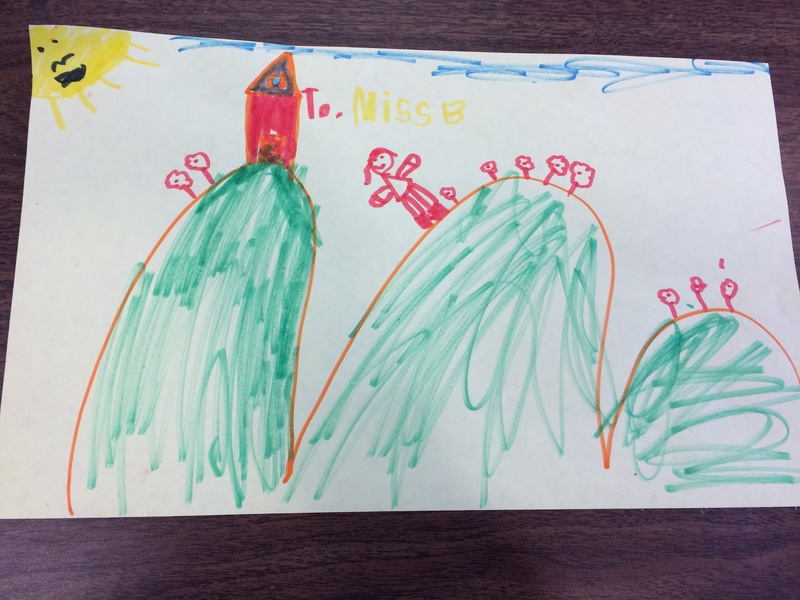 😀His teacher wrote me back and said she is happy to help him in class make it better. Yay! Yay for good days! I love the color of that material. Purple is awesome. Yup I love those good days!!! Looks like you may have used steel-cut oats and not rolled oats for the cookies? that will totally change the outcome. If not, don’t worry about how they look, its the taste that matters! I’m so glad your bread pudding was a hit! I knew it would be! Yup you’re right! I wonder where my brain was?? I understand, lol! 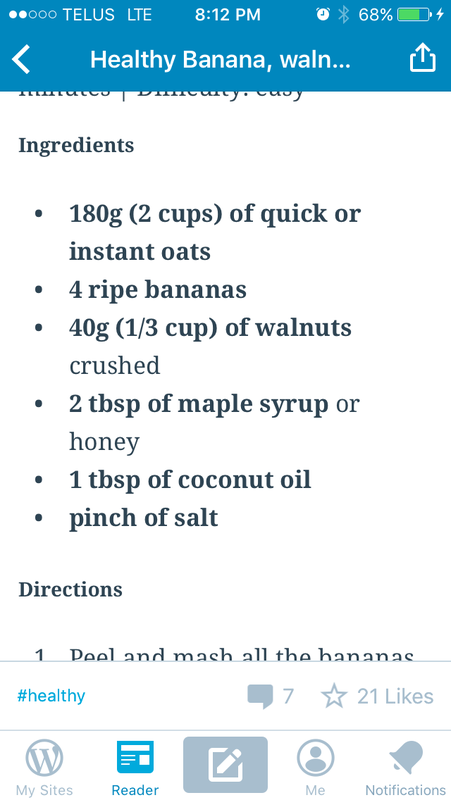 I have some yummy recipes using steel-cut oats on my blog if you want to look back through my posts. Or just let me know and I’ll find them for you! Looks like a great day, that card is so sweet! Wow I got tired just reading your post! But its a great feeling when we manage to accomplish all that we set out to do isn’t it… problem with me though is I get slack after and then things pile up again! LoL! I love the colour of your yarn ball and can’t wait to see what you make with it! Oh I’m hoping that doesn’t happen to me! Thank you, my fingers are itching to knit!!! The colors in that yarn are delightful! Aren’t they? My mom knows me so well! Glad things are going well. Sorry to hear of the loss of a former student. Prayers for the family. I have tried that cheese once and only once. It was not my favorite. Udi’s bagels are my favorite. I even like their bread. Yup I’ll be sticking with my soya and my black sheep Vegan! I usually go for glutinous over udi’s. Sounds like a great day! Aren’t massages the best? 😁 enjoy those last few pages! Can they lighten up on the pressure? I always ask my masseuse to knead harder… no pain no gain 😁 thanks for your thoughts and have a great day! That was an action-packed day… Congratulations on your running! You’ve inspired me to do something about my oft-missed exercise goals. Maybe you could try making a toque constructed vertically? The shaping is done using short rows, and I think they show off variegated yarn very well. Oh I’m glad I’ve inspired you:) there’s nothing like moving- I’m addicted to it now! Oh that sounds like an interesting toque. Do you know the name of a pattern I could search for?